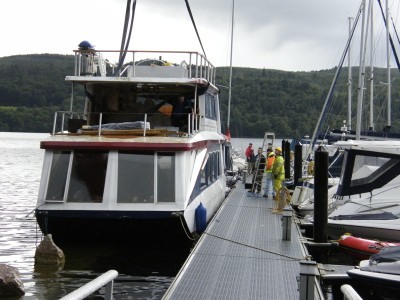 September 2008: Derek Abbott, trapped on Windermere for a year after failing to find a berth for his 48ft houseboat SWALLOW, pulled off his Great Escape from the lake in a torrential downpour. 'My boat was a broken dream. My exposed emergency mooring was costing me eight thousand pounds a year. At times I nearly gave up the struggle', he said as he watched his 17 foot high, 20 tonne aluminium boat cut into two pieces for road transport to the River Weaver in Cheshire. 'When I bought the boat I thought she would have a secure mooring. We loved it up there - just watching the ducks. It was a perfect contrast to our villa in Spain. 'When I found out that my mooring was temporary, I had her towed to a private jetty at the Old England Hotel, but the towing firm said she wouldn¹t fit in. Derek¹s wife Ann, who helps to run the family firm of North Manchester Joinery in Bury, Greater Manchester, said, 'At that point I told Derek to just give the boat away to someone. It was making him ill. He spent days trudging round the lake asking for help and offering to buy a mooring. The 48ft x 13ft 6in 'futuristic' Swallow is one of two big houseboats assembled on the lake years ago and once rented to weekenders at Ferry Nab, near Bowness-on-Windermere. It took the crew of a workboat, two mobile cranes with drivers and banksmen, two articulated semi-lowloaders and a three-man technical team from Sealand Boat Deliveries to extricate Swallow at the old wartime flying boat slipway at White Cross Bay, between Bowness and Ambleside. 'The directors of the White Cross Bay firm allowed us to use the slipway. I am very grateful to them', said Derek. The salvage team waited two weeks for a morning calm enough to allow the work boat crew from Jetties and Moorings to handle the huge slab- sided craft under tow. 'Frankly, the White Cross Bay people were the only boatyard who would or could allow us the time and space to cut the houseboat in two', said Andrew Rosthorn, of Sealand. 'But the old concrete slipway at White Cross Bay can catch you out. It slopes very gently, so mobile crane drivers have to set up way beyond the water¹s edge for difficult lifts. Sometimes they can¹t reach out far enough. When the driver of the 50T crane from Jardines of Lancaster hoisted the top deck of Swallow to a road trailer, Derek¹s twenty thousand pound Italian kitchen came into view. Granite table tops and two new Neff cookers were all exposed to the torrential weather. 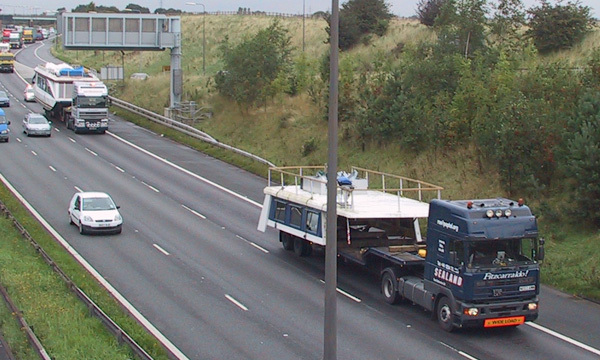 It took a second 90T crane, only available at night and working long after sunset, to lift the 18 tonne hull on to an extending semi-low loader. 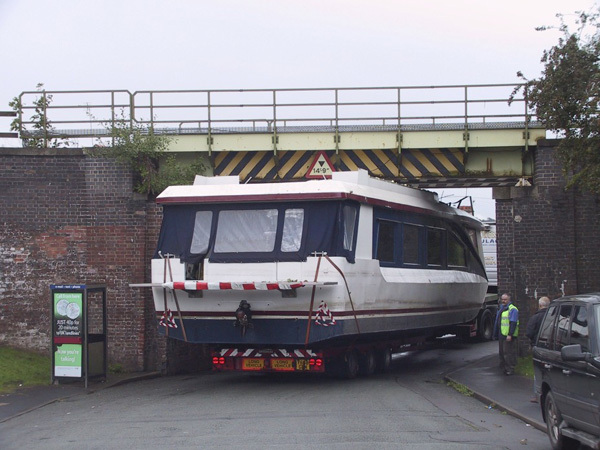 Derek and Ann had been told by Jalsea Marine on the Weaver Navigation that if they ever escaped from Windermere they could bring Swallow to a quiet berth near Weaver Shipyard, only accessible from Darwin Street, Northwich, Cheshire. The trouble about Darwin Street is that it passes under a 14ft 9in railway bridge, two feet lower than a motorway bridge. A day later, in a moment of truth at the Darwin Street bridge, only the forward railing on the main hull section of the Swallow needed dismantling. The hull cleared the bridge by less than one inch as the 60ft long trailer crept towards the shipyard. Derek Abbott waited by the bridge in Darwin Street with a crowd of local residents. 'As soon as I saw her coming out from under that bridge. I knew she had a future.